They won it all in 2005 when they were crowned International Barbershop Quartet Champions and are the only quartet in history who took top honors who are not all Americans. Based in Vancouver, Canada the quartet has an international flavor being comprised of 2 Canadians, one American and an Australian. And it's easy to see why they became champs as this fabulous new release is one of the best barbershop recordings we have heard to date. As it becoming more common in barbershop CDs not every track would be considered true barbershop by the purists yet the close harmonies and tight arrangements are most certainly in the barbershop style while other songs are straight ahead traditional gems. A realtime treat! Alberta, BC (Canada)-based RealTime is an a cappella vocal group that sings and performs in a wide variety of vocal music, from Contemporary to Barbershop and everything in between. They became the World Champions of barbershop singing in 2005 when they won the Barbershop Harmony Society contest, held in Salt Lake City. 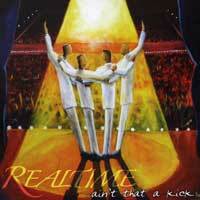 Their debut CD is "Four Brothers," containing the best material from their first year. 13 tunes: Barbershop tunes "When the Saints Go Marchin' In," "Come Fly With Me," "I've Got A Gal in Kalamazoo," "The Birth of the Blues," "All of Me," "Yesterday I Heard the Rain," "Keep Your Sunny Side Up," and "Everything's Coming Up Roses." The jazzy title tune, the jazz standard "It Was A Very Good Year," and the ballads "Loch Lomond" and "Anthem" round out the finely-crafted program. 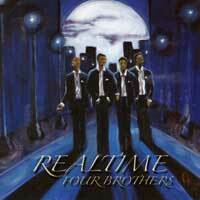 "Four Brothers" has the beautiful arrangements, tight harmonies and sheer great entertainment that are making RealTime one of the fastest-rising groups in the Barbershop world. Based in Vancouver, Canada and Bellingham, WA, a very talented pair of brothers, Tim & Doug Broersma and Mark & Tom Metzger, form four part a cappella quartet Realtime, who have been singing together since 2003. They quickly placed 2nd in the Harmony Sweeps Pacific Northwest Regional in 2004, then they became the 2005 International Quartet Champions of the Barbershop Harmony Society in Salt Lake City! Having reached the pinnacle of the barbershop world, they stopped competing in Barbershop contests. However, they continued to compete in the Harmony Sweeps, winning the Pacific Northwest again in 2007, and again in 2010, where this supergroup is an early favorite to win the upcoming National Finals May 15th! Listening to their jazzy, wonderfully arranged rendition of Dave Brubeck's jazz standard "Take 5" underlines the group's determination to "sing and record music of many styles, whatever (we) decide we like!" 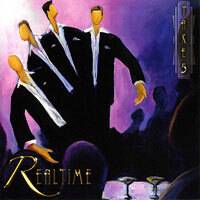 What Realtime likes includes 13 diverse selections, Lennon/McCartney's pop hits "With A Little Help From My Friends" and "Blackbird," "Over the Rainbow" from The Wizard of Oz, the Tennessee country anthem "Rocky Top," The show tune "On A Clear Day" (You Can See Forever), the scattish jazz favorite "Flight of the Foo Birds," the haunting spiritual "Follow the Drinking Gourd," and the Doobie Brothers' foot-tapping rocker "Listen to the Music." The last two cuts, "Funny Valentine" and "Georgia On My Mind," are harmoniously performed with the Whatcom Symphony Orchestra. "Take 5" is great stuff, the rock-solid harmonies and pure entertainment chops of this gold-medal-winning Barbershop group, joyously applied to some of our favorite tunes in other genres. Listening to it, we can't wait to hear Realtime at the Finals!